INCREDIBLE OPPORTUNITY TO OWN over 37 acres in a private picturesque setting accented by an equestrian set up. The spacious walk-out bungalow boasts 2,900 sq ft of developed living space. The freshly painted main floor has an open entry way, large living room w/ vaulted ceilings, huge windows w/ views, 3 way fireplace siding onto the dining room, a lovely kitchen w/ NEW APPLIANCES, lots of cupboards, pantry, island w/ a countertop stove, access to the low maintenance deck, powder room and laundry/mud room. The west wing has a master bedroom w/ his & hers closets, ensuite, 2 bedrooms & a bathroom. A spiral staircase leads to the lower level w/ in- floor heat that has a family room w/ wood burning FP, 2 bedrooms, renovated bathroom & storage/utility room. 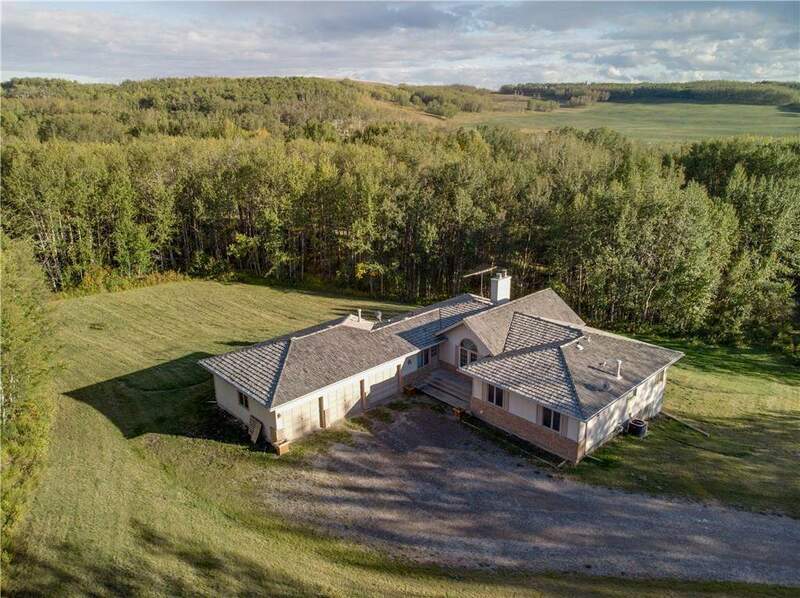 Land features: fenced and cross fenced sections, 4 Paddocks w/shelters, outdoor ring, seasonal creek & horse trails. The 40x60 shop features 2 sections of the same size, W is a shop w/ concrete floor & E has 4 horse stalls.